Decent-enough account of John F. Kennedy's wartime heroics...with some big problems. Warner Bros.'s Archive Collection, the on-line M.O.D. 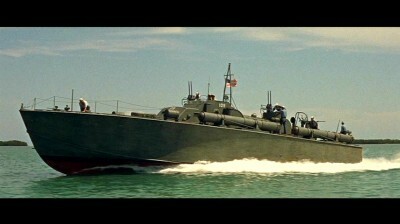 (manufactured on demand) service that opens up hundreds of little-seen library titles for the avid collector and movie fan, has released PT 109, the 1963 big-scale WWII actioner that purports to tell the story of JFK's time aboard Motor Patrol Torpedo Boat 109, and the heroism he and his men summoned up when they were shipwrecked in the Japanese-controlled Solomon Islands. 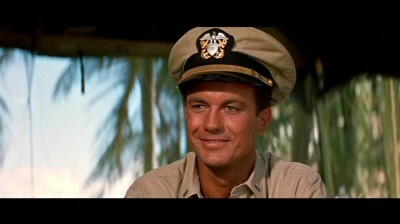 Starring dead-ringer Cliff Robertson, along with some familiar TV faces, PT 109 may be a little too TV-goofy for the more discriminating WWII movie fan, but it gets the job done well enough...I suppose. An interesting vintage promo-trailer is included in this excellent-looking transfer. Doubleyou Doubleyou Two: The Big One. 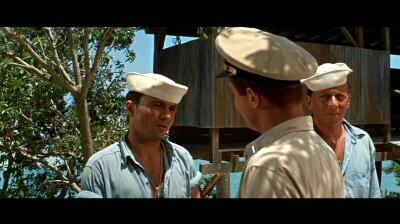 In the South Pacific, Yeoman Rogers (Lew Gallo) isn't sure he heard right: his superior, Lieutenant (JG) John F. Kennedy (Cliff Robertson) used his family influence...to be assigned combat duty? 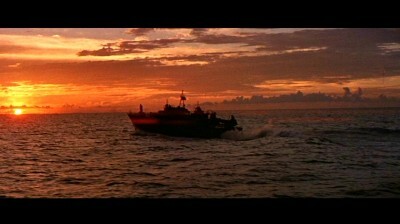 Transferred to Tulagi in the Solomon Islands, JFK wants a boat―any boat―so his commanding officer, C.R. 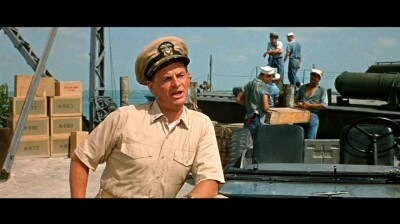 Ritchie (James Gregory) assigns him to PT 109, a battered, half-sunk wreck that Ritchie is confident JFK won't raise...especially when JFK says he can do it in a week. Drawing a good exec, Ensign Leonard Thom (Ty Hardin), and some grumbling but talented swabs like Bucky Harris (Robert Blake) and Edmund Drewitch (Norman Fell), PT 109 is ready for service by the deadline. 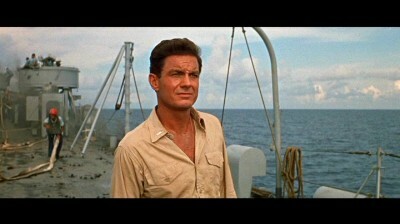 During JFK's first mission, he shows his bravery by running his boat close to the Japanese when picking up some stranded Marines (and almost buying it when his boat runs out of fuel), but his real test will come when PT 109 is sliced in half one dark night in the Pacific, and JFK must swim with his wounded men to "safety" among the Japanese islands. JFK was before my time, but growing up in the 70s, PT 109, the first (and only?) feature film biopic made about a sitting president, was a constant presence in syndication, so his wartime exploits, next to the events of his assassination, of course, are probably the most readily available impressions I have of him. I'm certainly no student of Kennedy or his time in the Navy, but from what I've read, PT 109 is a reasonably close approximation of what happened in those South Pacific waters during the early years of the war. 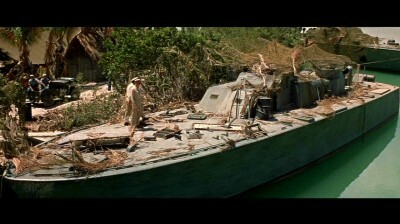 Of course there are inventions and compressions, just as in any biopic (the biggest fib here seems to be how the two native guys really came up with that whole "message on a coconut" thing that led to JFK's crew's rescue), but nothing I've read suggests PT 109 is anything but a fairly accurate portrayal of those adventures. PT 109 came out in the summer of 1963, when the bloom was fully off the rose of JFK's presidency, so critics didn't feel the need to genuflect before it just because of its subject matter. 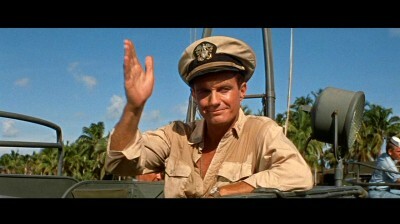 It received at best fair-to-middling reviews, and weak box-office that couldn't compensate for a bottom line that was plagued by production problems, including the replacement of the original director, Lewis Milestone, and location shooting troubles down in the Florida Keys (and maybe all that interfering White House hands-on influence Kennedy secured from producer Jack L.Warner). Watching it today, it's rather remarkable for its inability to summon up any sense of importance, either as a straight, hard-pounding WWII actioner, or as a vital, informative, living breathing document of a U.S. president's wartime heroics. Rather, PT 109 looks and sounds and acts like an elongated TV show, due in part, no doubt, to the efficient but completely anonymous direction by longtime TV vet, Leslie H. Martinson. So despite a long, long running time of almost two and a half hours, and subject matter that for once in a Hollywood feature film is demonstrably "true" and "historical"... PT 109 comes and goes without leaving much of a wake. Now don't get me wrong: PT 109 functions just fine as a mindless WWII actioner. 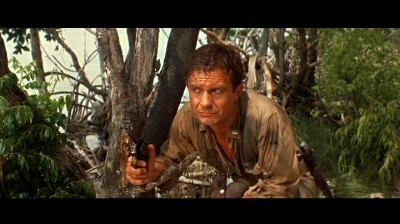 The conflicts between junior officers and senior officers, and junior officers and lowly seamen, are perfunctorily set up, just like in so many other WWII films you've already seen; the so-called "comedy relief" often found in service films is here, too, for generic laughs; and the action sequences―the best parts of the movie―are executed with a basic power and efficiency that denotes a fairly good-sized budgeted Hollywood exercise. 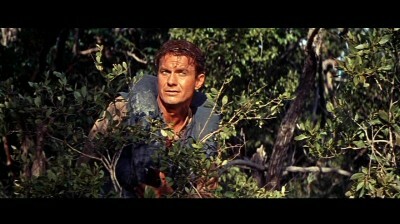 And the actors are all pleasant enough. If you're a fan of vintage WWII movies, you'll find pretty much everything else you've ever seen in your basic Hollywood war movie, here (except for any dames). And that can be enough, if you don't need anything more for those particular 2 ½ hours. However...if you do feel a little scrappy towards PT 109, its problems pile up fast. I don't know if it was because the White House was so hands-on with this film, or because JFK personally picked too old, too starchy Robertson for the role (Jackie O's choice of Warren Beatty would have worked better...but Edd "Kookie" Byrnes??? ), or because of the script...but "JFK" the character here comes off as an impossibly too-good-to-be-true saint. Robertson plays JFK not as the skinny, cocky kid JFK probably was, but as JFK the "presidential public image" as it appeared to people in 1963: mature, smooth, impossibly poised, and entirely "correct." We're not watching a kid trying to figure out how to survive WWII; we're watching a grown man who's already figured it all out. It's a campaign trailer. 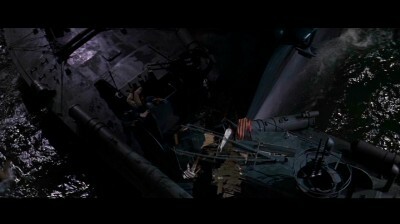 As for all the dopey, half-assed "comedy" in Richard L. Breen's script (accentuated by that jiminy cricket score by David Buttolph), one never gets the feeling that anyone is really at war in PT 109; even when the crew is stranded and trying to survive, we never feel or smell or even suspect the stench of death is coming. It's as if the events happen in a vacuum, or on a picture post card (the clean, well-scrubbed, color-soaked cinematography by Robert Surtees is lovely...for a South Seas islands picture with Virginia Mayo). And not to suggest in any way that JFK's exploits weren't heroic―they most certainly were―but they don't feel all that heroic here, because director Martinson can't visualize them with any oomph, or any sense of danger. 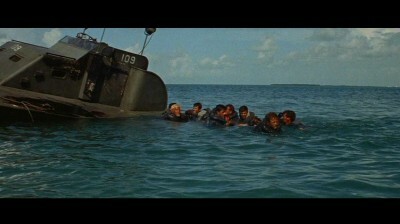 PT 109's wreck is handled okay, but the rest of the film is the men swimming around, or waiting on the beach to be rescued. How the hell is that exciting? I hate to say it, but maybe this is one true WWII story that needed a little bit of that 'ol Hollywood bullsh*t treatment, with some invented heroics added, and maybe a few broads―you're telling me that hound Jack wouldn't have liked that?―to liven up the joint (from what I've read, Kennedy thought the movie was a stiff, too). 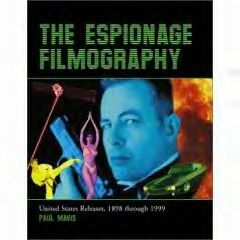 This is filmmaking that's D.O.A., entirely too reverential and hands-off from its subject matter―subject matter that may not really have warranted a full-length, big-budget treatment...had its protagonist been anyone other than the sitting President of the United States. Most fatal of all, though, with PT 109, is its length. At 142 minutes, it collapses under its own non-importance. All the gripes I just recounted about the movie would have been lessened―or maybe some even eliminated―had someone taken the scissors and cut a good 40 minutes out of this film (at least). Then, PT 109 might have moved, it might have been funnier, and the heroics might have matched up with the treatment. But again...I get the feeling someone wanted a bona fide "epic," and that's what was delivered. The wide 2.4:1 anamorphically enhanced transfer for PT 109 looks terrific, with saturated color (a few scenes look a little yellowy) and a sharp, sharp image. Grain is noticeable at times, but not distracting. The Dolby Digital English mono audio transfer has been re-recorded at a good 'n' loud level, with little hiss or fluctuation. No subtitles or close-captions included. There's a cool original promo/trailer included here, with Robertson talking directly to us about the film. 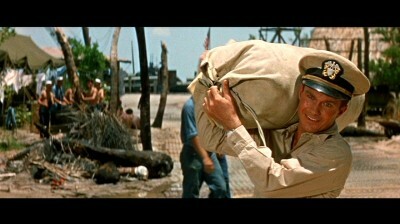 Way, way too long, and too good to be true when it shows a JFK who's preternaturally calm in the face of WWII. Still...it looks good, and the action, when it shows up, is okay. If you've got a yen for WWII heroics, PT 109 delivers well enough. A rental will do for everyone else, but PT 109 is a buy for fans of the genre.